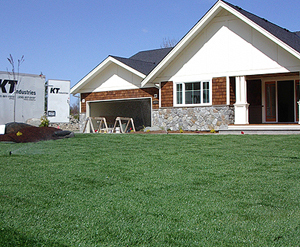 BC Instant Lawns and Landscapes, New Lawn Installation, Farm Fresh Sod Roll / Turf Grass Supplier, Vancouver, BC. Sodding Contracting. or call us at 604-454-4954.We appreciate your inquiry and look forward to working with you. of our sod products and sodding services. 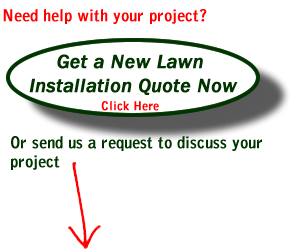 Do you have a lawn installation quote from a different company? *To qualify for the special price, minimum area size must be over 900 square feet. Includes old lawn removal and disposal, 3 inches of premium turf type topsoil, premium grade West Coast blend sod, labor and machinery, Taxes additional. Prices may change depending on difficuty of access to lawn area. Need your new lawn sod installed within 48 hours Guaranteed? Click here and ask us for an on site estimate before we install your new lawn. 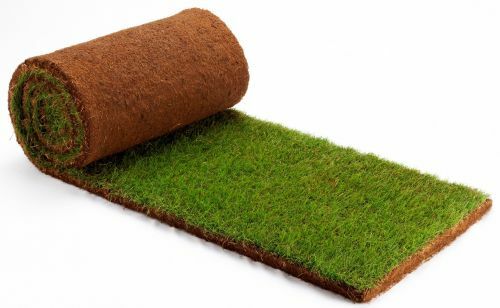 Looking for a small amount of sod / just a few rolls to patch your lawn or for your pet? If you are wondering what the price of sod is, get a price quote for sod delivered or picked up from BC Instant Lawns. BC Instant Lawns gives you free online estimates for your new lawn installation project: Get an new lawn install estimate here. We are now serving the Okanagan area and Vancouver Island with sod and sodding services. You can buy farm fresh sod online now from BC Instant Lawns. 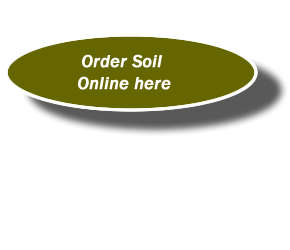 We give you sod prices and order times instantly when you complete a simple form. We deliver throughout Vancouver, Vancouver Island and the Okanagan. Thank you for visiting BC Instant Lawns, we look forward to installing your new lawn or supplying you with sod and soil products. We Sell & Supply and Install Great New Lawns in the Vancouver area, Vancouver Island and Okanagan. Complete the form on this page to get a new lawn installation estimate. If you know your square footage we can provide you with a quote immediately and start your project within the week. We are also Vancouver's Source for fresh sod and soil delivered to you....Through our on-line lawn sod store we also sell fertilizers, grass seed and a variety of other lawn products for your new lawn. Looking for someone to lay a new lawn using sod / turf grass rolls? BC Instant Lawns and Landscapes is your professional lawn installation and landscape company. If you're looking for a residential lawn installation, sport, golf or commercial new lawn sodding project get a free instant estimate online from us. 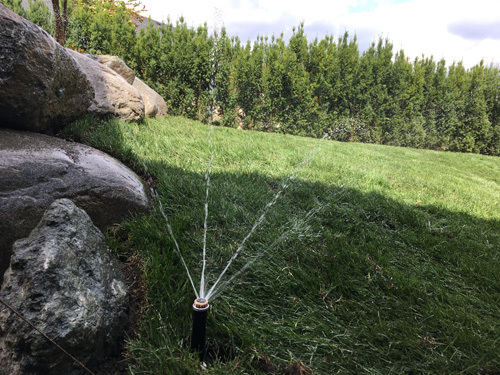 We provide sod and sodding service throughout the Metro Vancouver area, Victoria, Nanaimo, Whistler, Squamish, Penticton, Kamloops and Kelowna. 1. We remove the old lawn area. This involves the use of a sod cutter to a depth of 2-3 inches into your existing soil. 2. We install a 3 inch base of turf blend type top soil. This soil is primarly washed sand based. 3. We prepare your soil by raking and rolling until we are happy with the grades and level. 4. We fertilize the soil before laying the sod fresh from the turf farm. 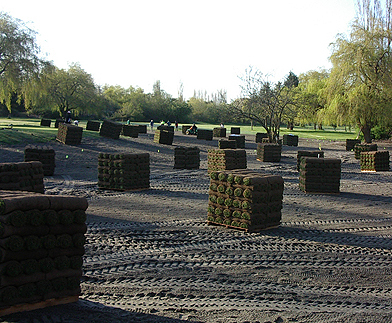 During warm weather we may moisten the soil lightly before installing the sod rolls. After recieving your sod from the sod farm, we will make sure your sod is fresh and acceptable for your new lawn. 5. We install the new sod grass in a brickwork fashion, not overlapping, just nice and snug together. We cut the sod rolls using a sharp knife. The excess can used to patch in other grass areas. 6. The newly sodded lawn is then watered and rolled again (if required). 7. We power wash your yard and leave you with complete lawn maintenance instructions. You new lawn installation is now complete. Enjoy your new grass lawn. BC Instant Lawns is a turf farm / sod farm supplier in British Columbia. 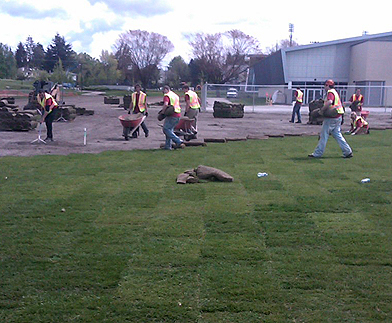 Does your project require a sodding crew to install the new grass? Call BC Instant Lawns for an estimate. 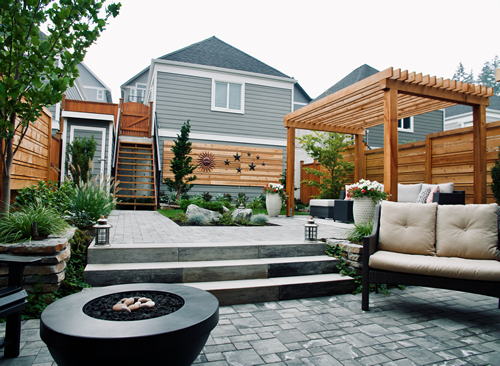 BC Instant Lawns and Landscapes, Turf and Sod Installation throughout Metro Vancouver. Victoria, Naniamo, Penticton, Kelowna, Whistler, Squamish, Surrey, Delta, Richmond, Maple Ridge, Langley, Mission, Coquitlam, Burnaby, New Westminster, North and West Vancouver....Looking for a great new lawn installed?